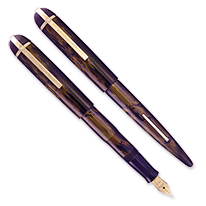 We offer fountain pens from manufacturers that we know, trust, and have exceptional customer service. Many of these pens can be found in our personal collections. Because we want you to have the best experience possible when you purchase a fountain pen from us, we tune each nib at no extra charge unless otherwise requested. We fill the pen with Waterman Blue-Black ink and write with it on paper from the same fountain pen friendly pads we sell, adjusting as necessary to bring it up to our standard for smoothness and flow. The result is an adjusted nib, not a customized one.